The song appears to date from 1903 / 1904. 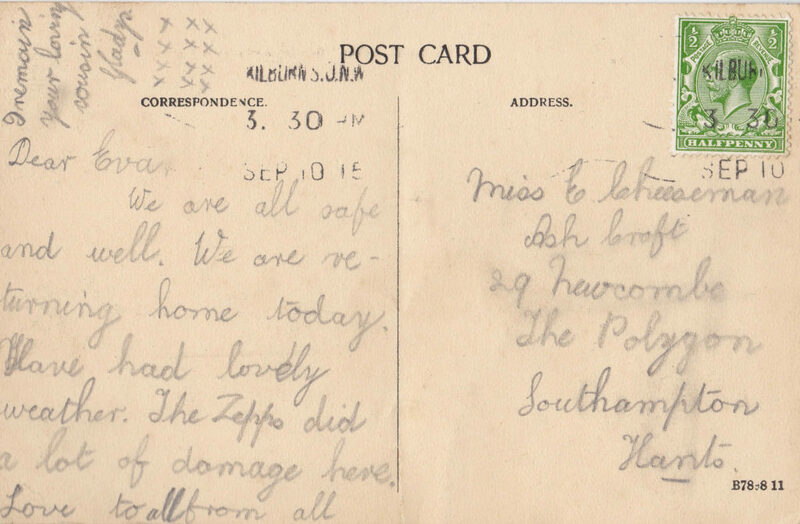 There is a recording apparently dated from 1903 by a Miss Edith Manley. The song may also been a re-work of a song with much the same words titled “Down at the Anheuser Bush” – a song commissioned by the Anheuser-Busch brewing company which also seems to have appeared in 1904. The Anheuser Bush origin my be correct as the Old Bull and Bush version has a German band reference and the Anheuser Busch company grew out of the 1860 take over of the Bavarian Brewery in St. Louis by Eberhard Anheuser. The song appeared in a number of pantomimes at Christmas 1904, but it was Florrie Forde’s recording of the song and live performances that appear to have given the song popular appeal at the time, and the longevity needed to keep the song in the cultural background 115 years later. 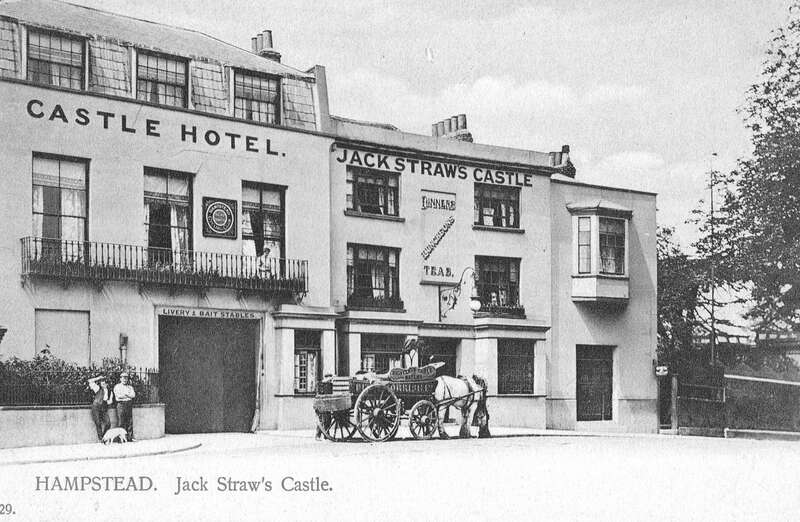 The song may well also be the reason why the Old Bull and Bush did not go the same way as Jack Straw’s Castle. Florrie Forde was born on the 16th of August 1875 in Melbourne, Australia, She was the sixth of eight children of Lott Flannagan, an Irish-born stonemason and Phoebe Simmons. Although her last name was Flannagan, she adopted the surname of a later step father to become Florrie Forde. 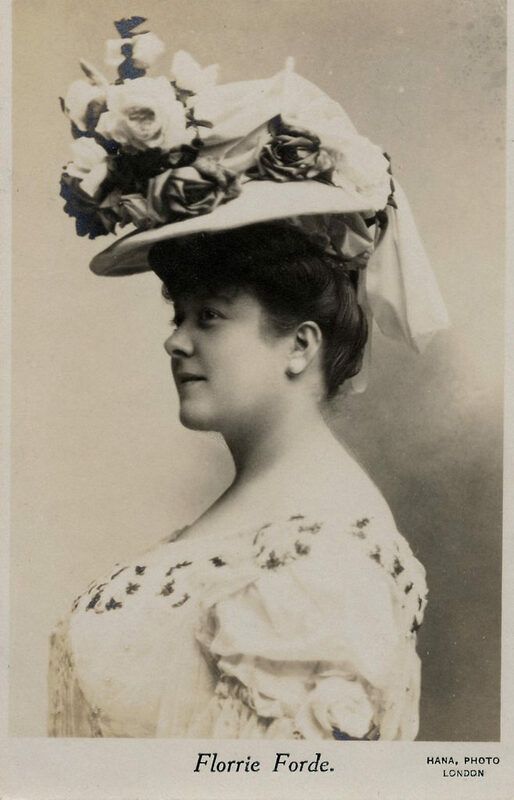 She had success in Australia, but moved to England in 1897 where she started to appear in London music halls. This was the start of a very successful career which would last until her death in 1940. 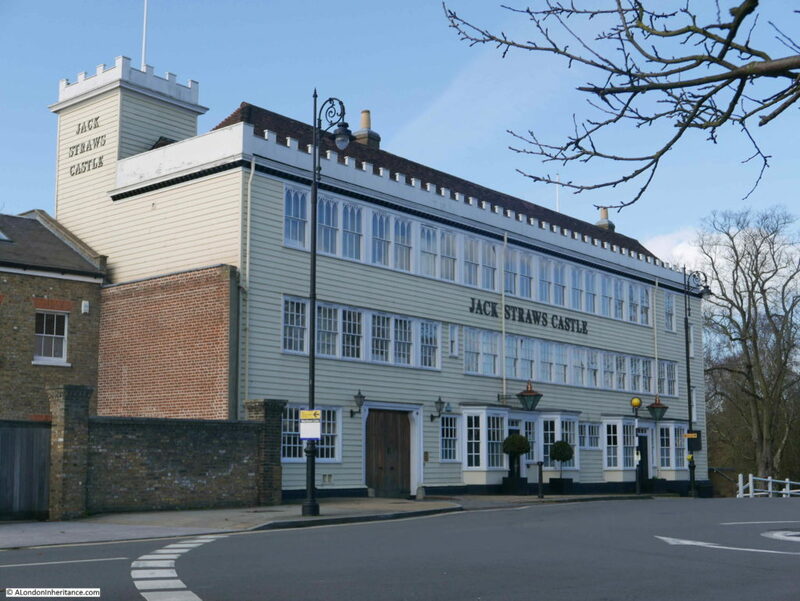 The style of the building is much the same as my father’s photo and the pub you will see today, however it has also clearly had some major redevelopment. Hampstead pubs were major attractions during summer weekends and public holidays, when Londoners would have a rare opportunity to stop work and head to the open space and clean air of the heath. 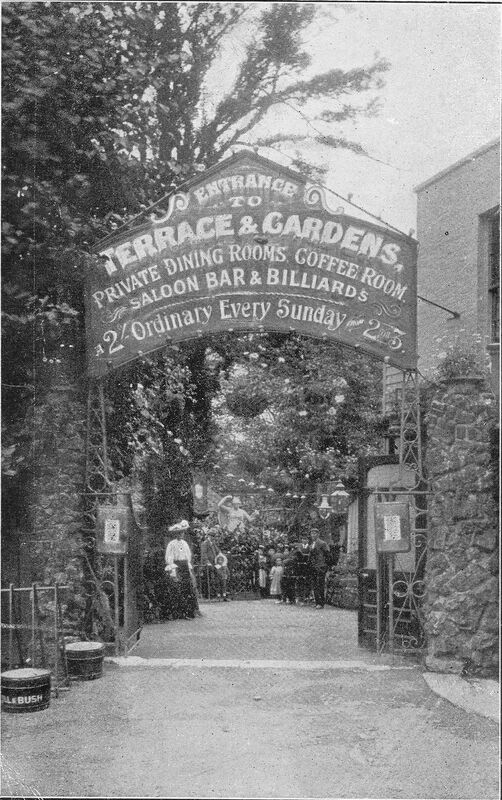 As well as the open space, fun fairs could be found on the heath as well as the Vale of Health and the pubs would always be a popular destination as shown in the following photo where crowds are heading into the Terrace and Gardens which could be found at the rear of the pub. “A RECORD BANK HOLIDAY – CROWDS EVERYWHERE – DAY OF SUNSHINE – SIGNS OF PROSPERITY. Absolutely empty was the Londoner’s verdict about London yesterday, as he strolled about the sunny streets of the metropolis. The fact remains that it was a wonderful Easter Monday, and that many holiday records were broken. The weather had a good deal to do with it. It was bright enough for June, and nearly warm enough for July. But the weather was not all. This is a time of good trade, and everybody is doing reasonably well. They are in the mood to enjoy a holiday, and they can afford to do it in ease and comfort. The railway companies are unanimous in paying tribute to our satisfactory prosperity, as shown by the money we spend on pleasure. The passenger traffic on the Great Western was the highest ever recorded for Easter. Forty-four excursion trains left Paddington during the holidays. Liverpool Street station was a scene of unprecedented activity for the time of year, and 100,000 passengers left it during the week. More people went to Germany by way of the Hook of Holland, than ever before. Fifty crowded excursion trains poured into Blackpool yesterday morning. I am always struck when reading these old newspapers, that whilst some things have changed, so much remains the same. This coming Easter weekend, crowds will not be taking excursion trains, indeed long public holidays are often when stations close for engineering work as Euston is during the coming Easter weekend. However if the weather is good, it is almost guaranteed that TV reporters will be at one of the seaside resorts with scenes of crowded beaches and interviews with ice cream sellers praising the increase in business. 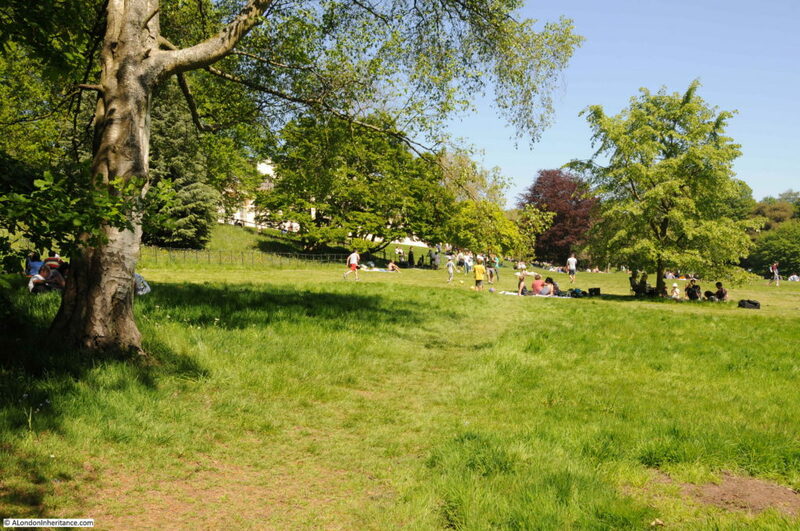 Hampstead Heath will also be busy, as will the Old Bull and Bush and The Spaniards. 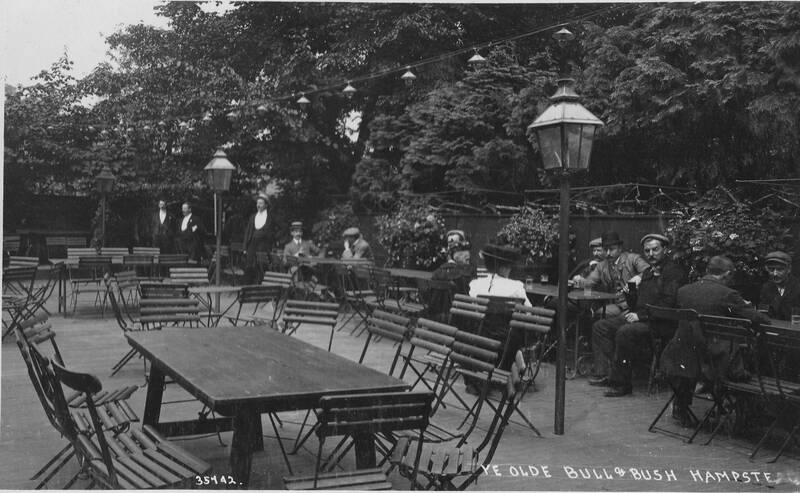 The Terrace and Gardens appear to have been a key part of the success of the Old Bull and Bush. The following view shows part of the gardens. Change the clothing of those sitting at the tables and this could be a pub garden today. The above two photos shows lights strung along the gardens. This must have been a popular destination for a summer evening’s drink. 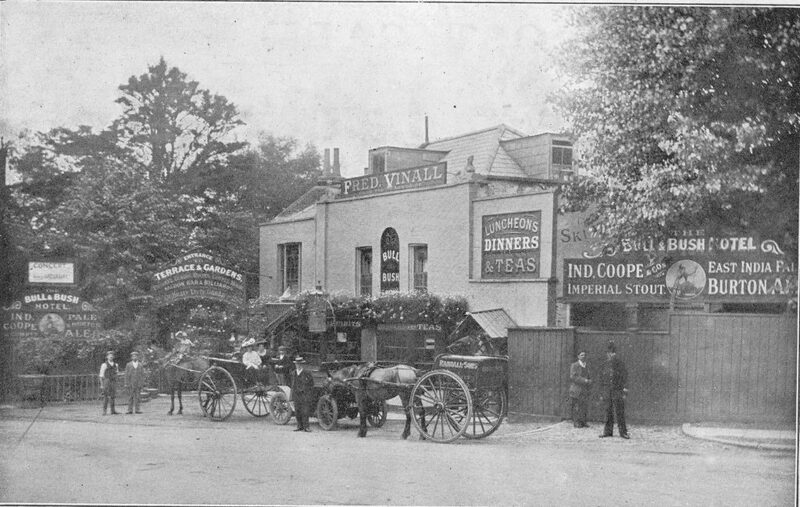 Some history of the Old Bull and Bush can be found in the Hampstead and Highgate Express dated the 15th September 1888. 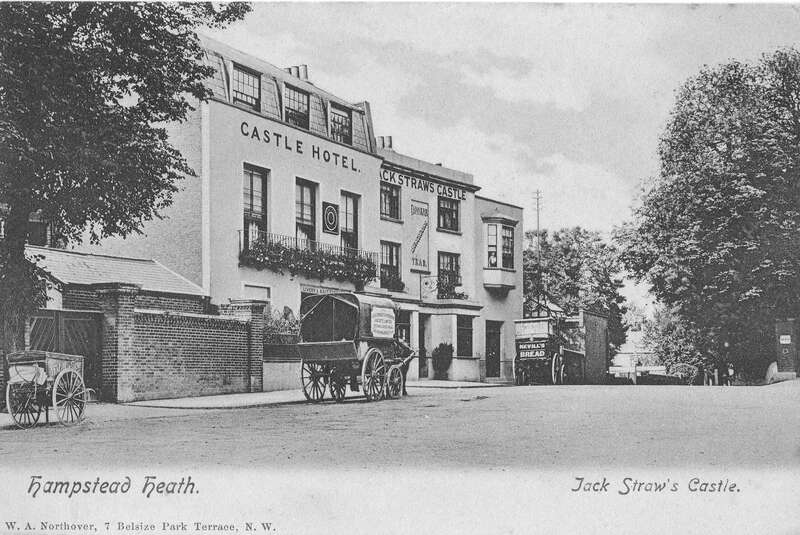 Note that in the following article the pub is called the “Bull and Bush” so the Old was added at some point between 1888 and the end of the century – an early attempt at marketing the history of the pub to visitors to the heath. “No tavern situated in the suburbs of London is better known than the Bull and Bush. 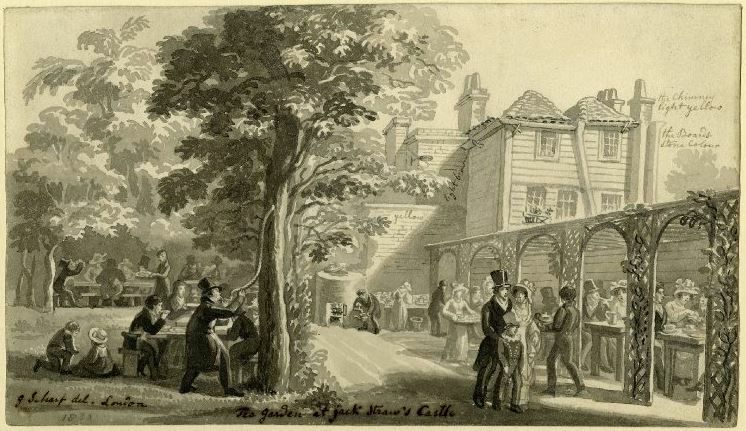 Contiguous to some of the loveliest bits of Hampstead scenery, and possessing pleasant garden grounds, the Bull and Bush is all that can be desired of an old fashioned, comfortable, roadside hostelry. 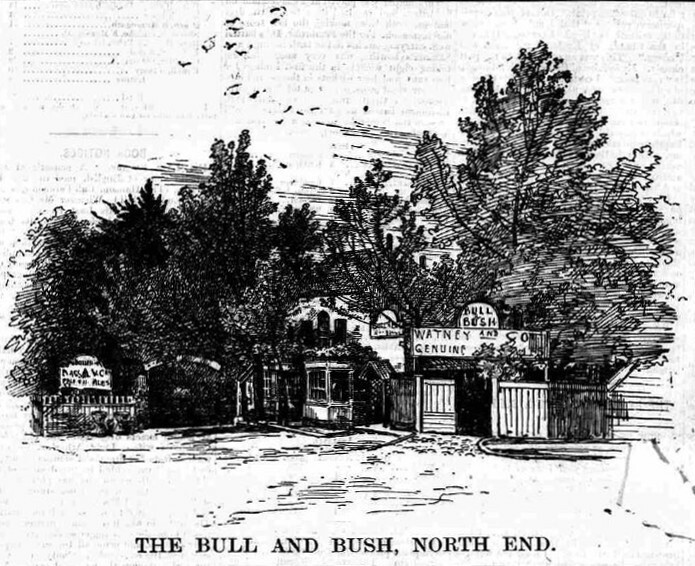 These characteristics, added to the attractions of its rural surroundings, have made the Bull and Bush a favourite resort for Londoners. 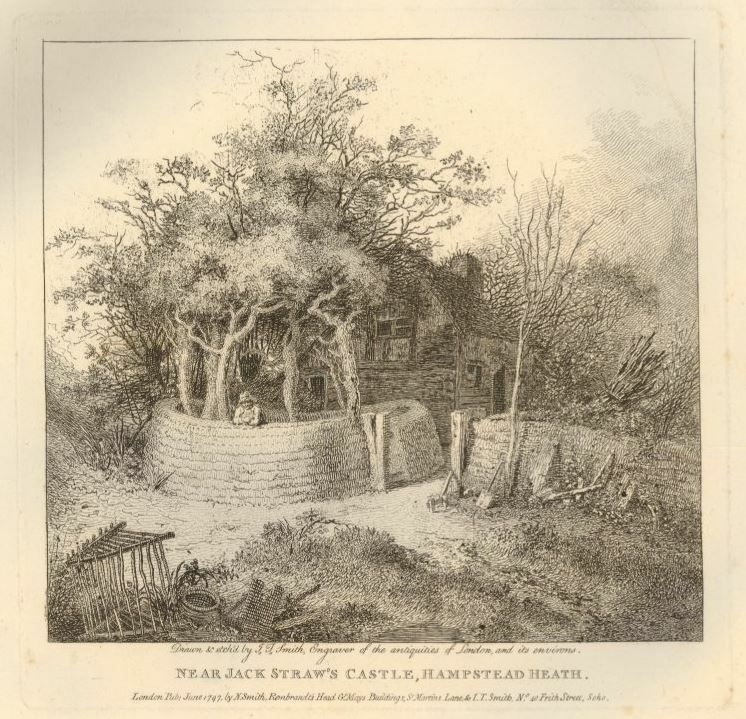 The Bull and Bush was originally a farm house and the country seat of Hogarth (by whom the yew bower in the garden was planted); and which, after its transformation into a roadside place of refreshment, attained some reputation as a resort of the London wits and quality. Tradition informs us that the place was visited by Addison and several of his friends. North-end must have charmed them by the picturesque beauty of its situation. This feature of the spot still retains, notwithstanding the innovations of brick and mortar, and the construction of roads through regions once sacred to grass and wild flowers. 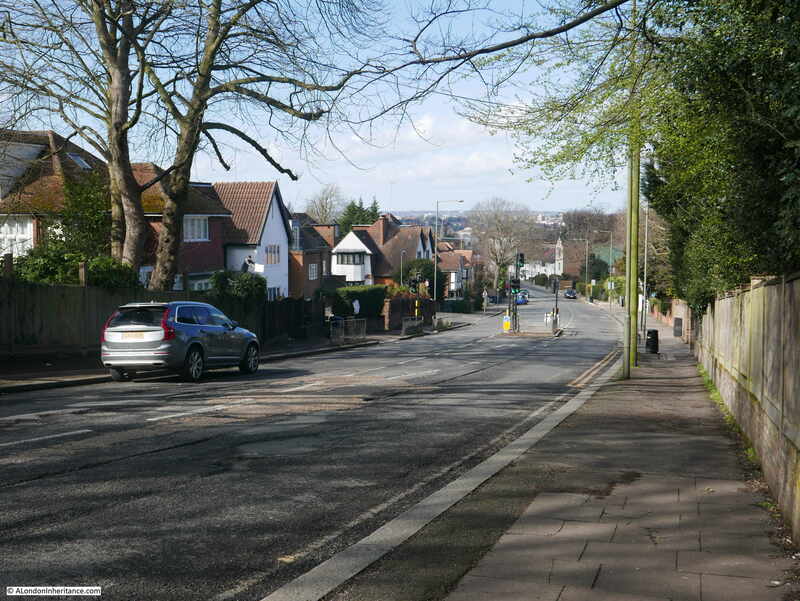 The approach to the Bull and Bush from the town of Hampstead, with its glimpses of gorse and brushwood near Heathbrow, and the foliage in the gardens of Wildwood, remains one of the most beautiful places in suburban London. 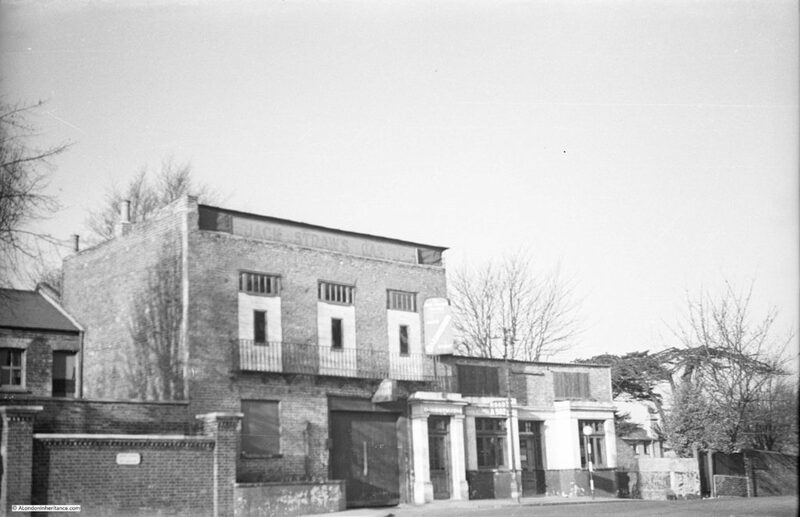 The Bull and Bush, like other old Hampstead taverns, has many interesting bits of gossip connected with its history. 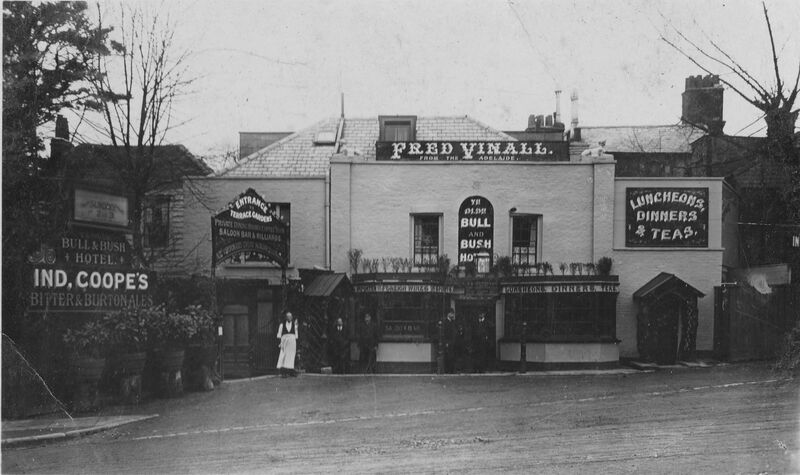 The peak in popularity of the Old Bull and Bush appears to have been around the time that Fred Vinall was licensee as the majority of photos of the pub have Fred’s name in large letters along the top of the building. 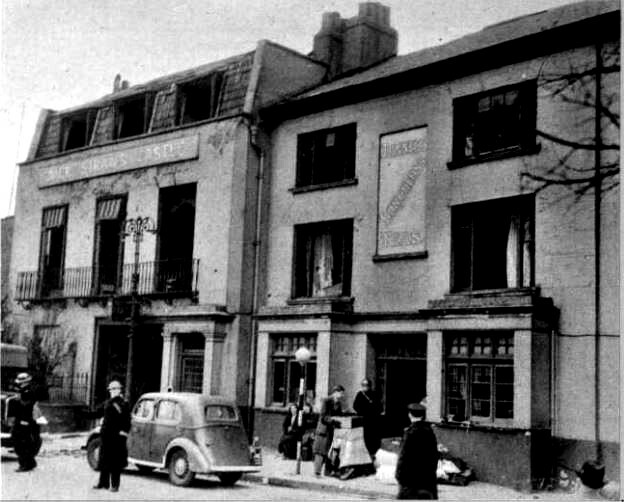 I wonder if that is Fred, standing outside the pub in the white apron in the above photo? He took over the pub in 1905. Comparing the photo above, with the 2019 photo below shows that while the style of the pub has remained the same, the building has undergone some significant redevelopment, including the separation of the pub from the road by the wall and pavement. The road to the right of the pub has a lovely terrace of houses. I suspect the buildings on the left were originally stables. 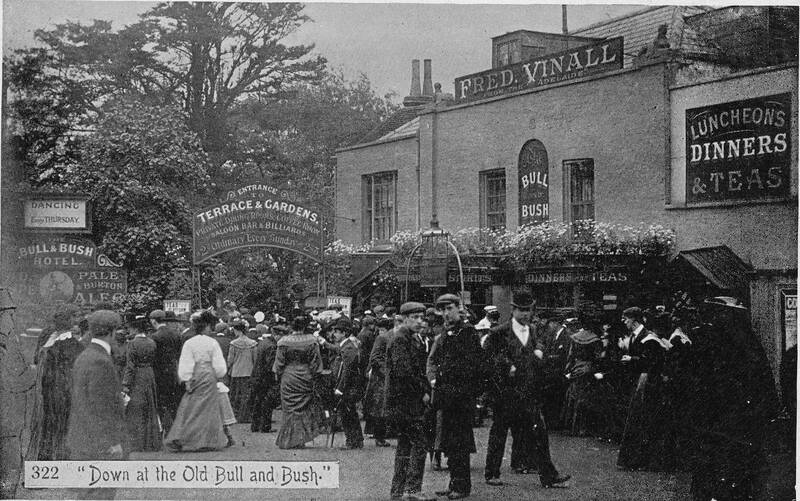 The attraction of the Old Bull and Bush has always been its location, and the 1888 newspaper article mentioned that the area “remains one of the most beautiful places in suburban London”. 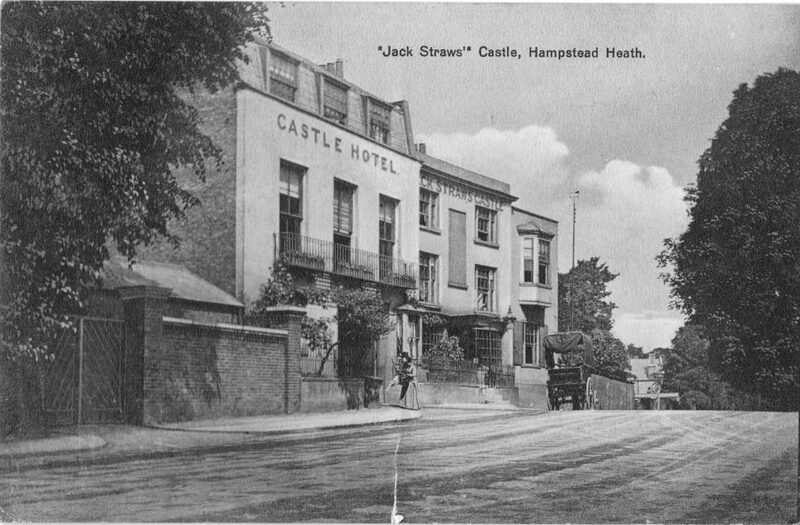 Whilst the road heading down into Golders Green is now surrounded by housing, the road continuing up towards Jack Straw’s Castle and then into Hampstead retains the appearance it must have had in the heyday of the Old Bull and Bush. This is the view looking up in the direction of Jack Straw’s Castle from where I was standing to take the photo of the Old Bull and Bush. 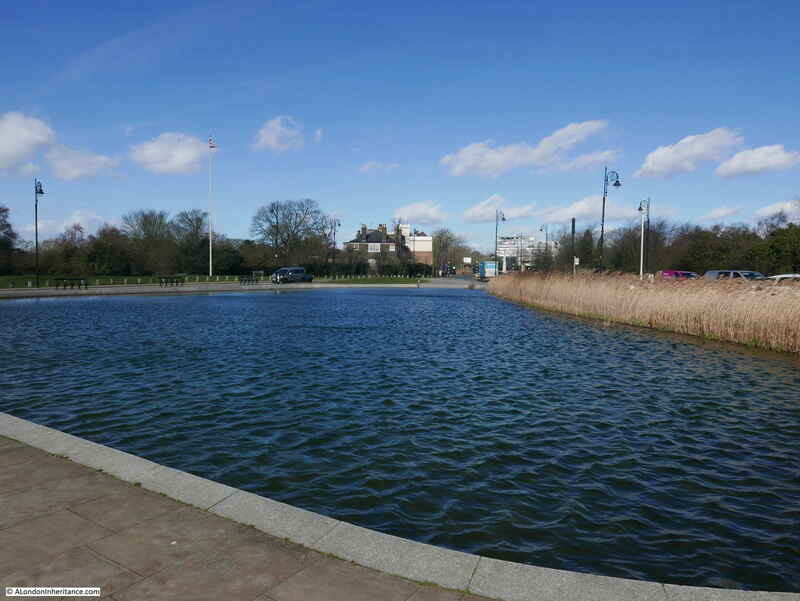 It is a lovely walk on a sunny day up from the pub to Jack Straw’s Castle and Whitestone Pond. A short terrace of houses hidden in the woods. 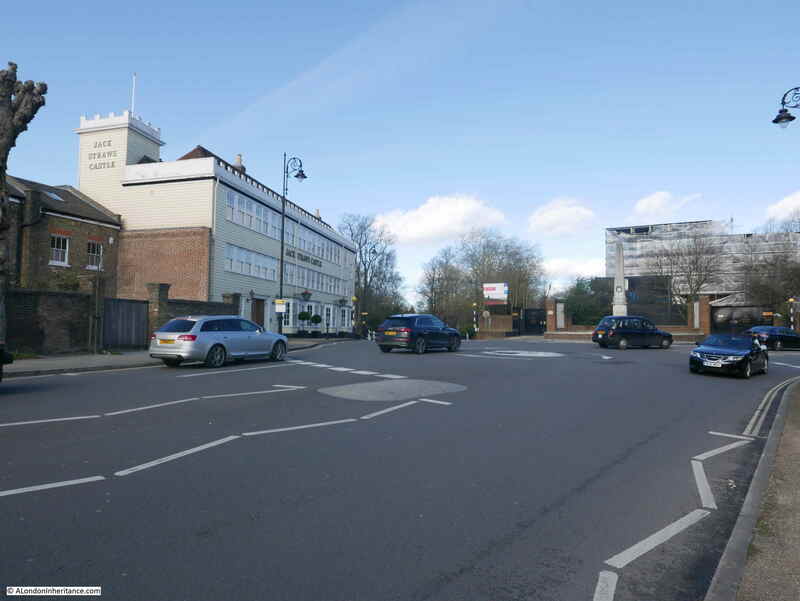 The street leading down to Golders Green station has a wide range of different architectural styles, probably a result of the speculative building on smaller plots of land that developed the area between Golders Green and Hampstead. I spotted a couple of Blue Plaques in the street. One for Anna Pavlova, the Russian prima ballerina, who spent much of her life living in the Ivy House on North End Road. 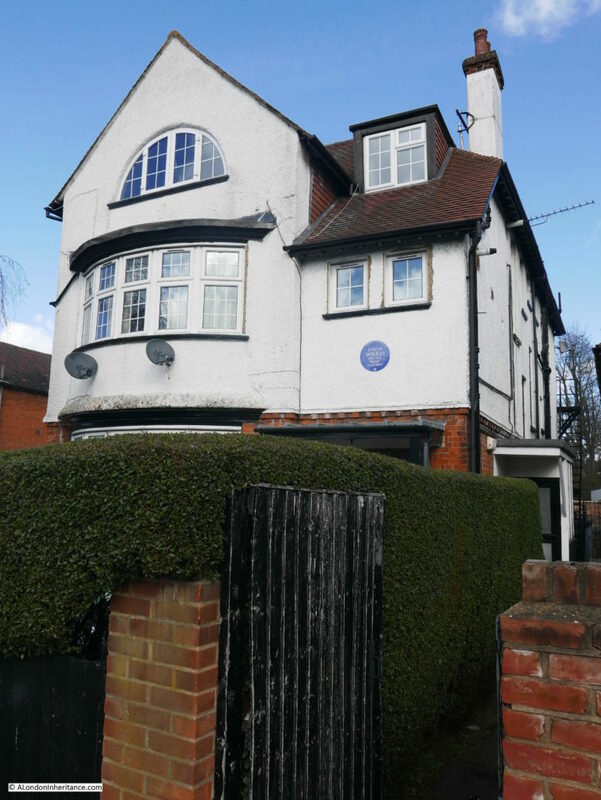 The following plaque is for the writer Evelyn Waugh who also lived along North End Road. 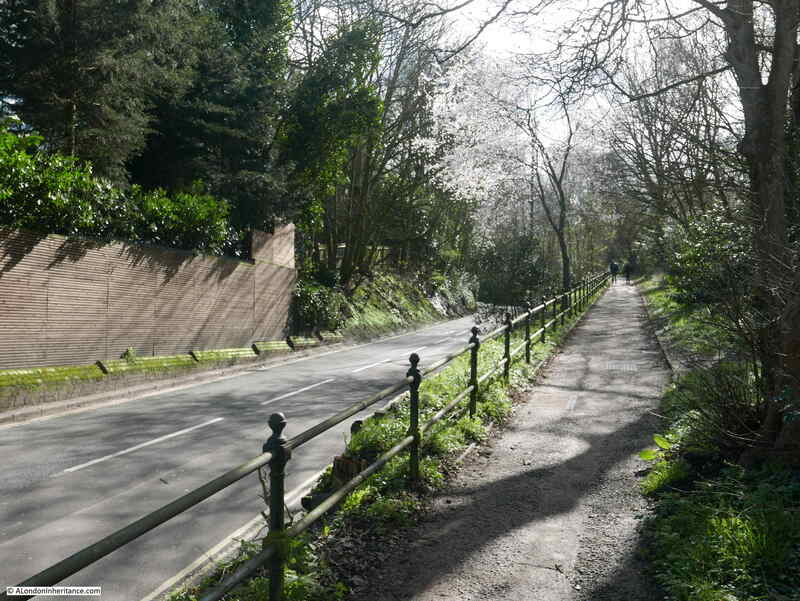 The short walk between Golders Green and Hampstead station is a lovely walk. 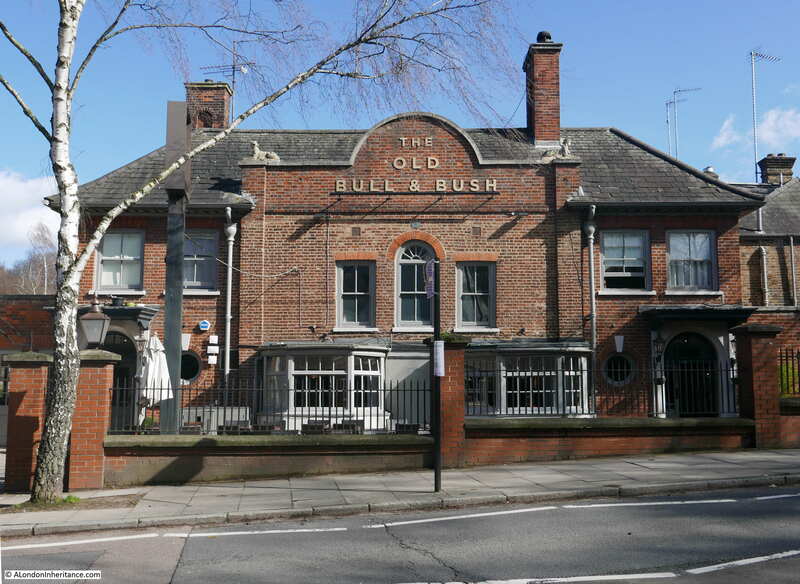 If you start from Golders Green and walk up the hill, the Old Bull and Bush is a perfect stop before the final climb to the highest point in metropolitan London. If you take the underground, do not follow the instructions in the “Getting Here” section on the pub’s website, which strangely states that the pub is “Located a quarter of a mile from Bull and Bush Underground station” – this was a planned station that was part built but never opened. 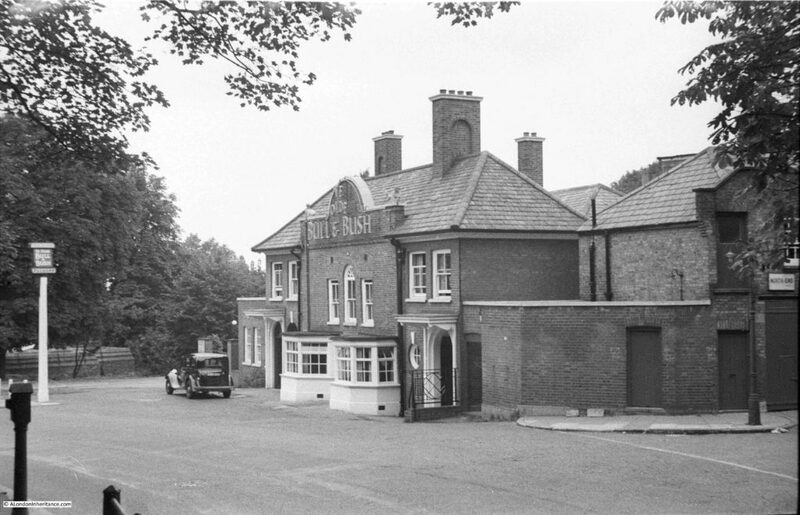 Intended to serve building on the heath to the north of the Old Bull and Bush, which fortunately was never built. Next time I am in the pub I will have to ask them for directions to Bull and Bush Underground station (there is a surface building for the original entrance shaft, but it is clearly not a station – a subject for another post, even better if TfL could let me see the old station shafts and tunnels!). It was relatively quiet during my visit, but if we have the same weather as reported in The Standard from 1906 for the Easter Bank Holiday weekend in a couple of weeks, the Old Bull and Bush, as well as the other pubs around Hampstead Heath will be looking forward to the additional trade that good weather has always generated. 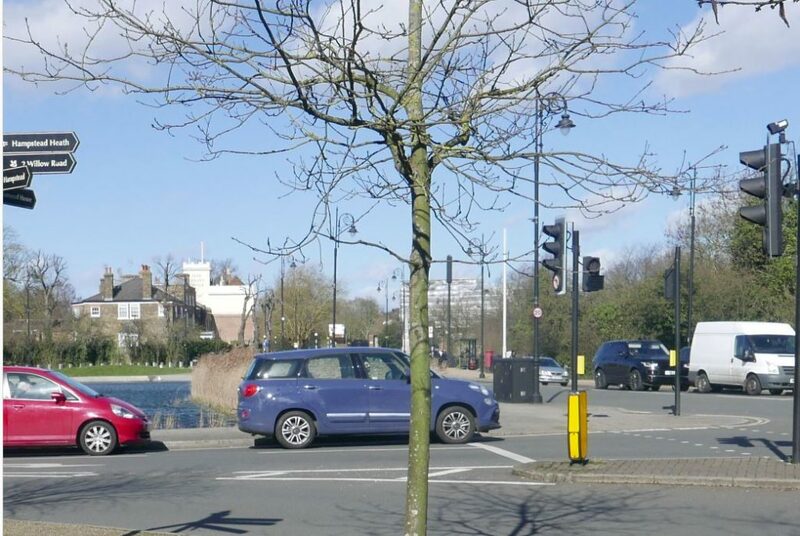 This entry was posted in London Pubs and tagged Hampstead, Hampstead Heath, London Pubs, Old Bull and Bush on April 7, 2019 by admin. 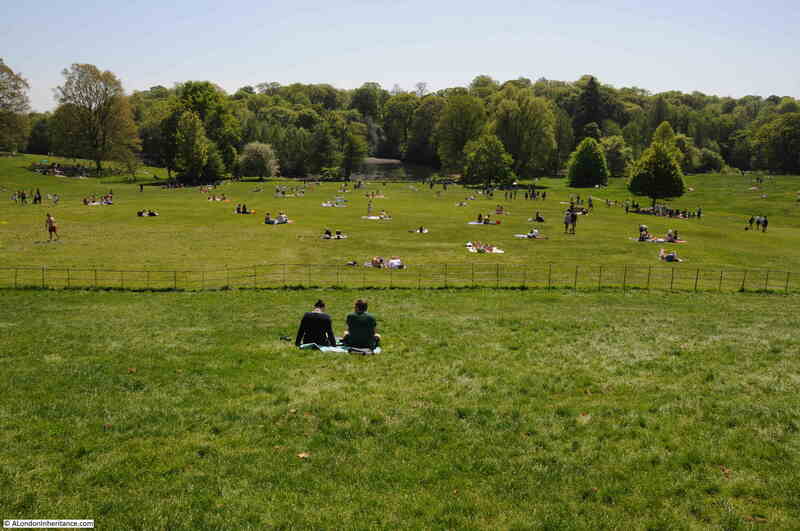 Last Monday, the early May public holiday, I headed to Hampstead Heath to visit Kenwood House. I probably chose the wrong day to visit as it turned out to be the hottest early May holiday for decades, but the weather was fantastic, there was not a cloud in the sky, and along with what seemed like hundreds of other people, I headed along Hampstead Lane to enter the heath at the rear of Kenwood House. 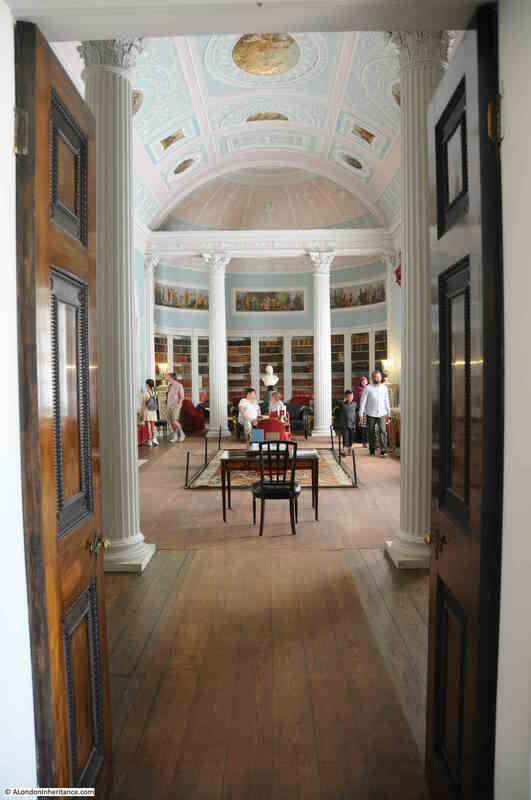 The reason for the visit was to take a couple of photos of Kenwood House as my father had done some years before. Kenwood House sits on flat ground at the top of a long grass slope down to some rather large ‘ponds’. The land in front of the house has a short, steep fall, then a smoother fall down to the water, thereby reducing the height of the land in front of the house compared to the sides. This has the effect of leaving arms of higher ground branching out from either side of the house and running either side of the central grassy slope. Standing on this higher ground provides a superb view of the house, which was obviously the intention of the landscape design. The first Kenwood House was built in the early 17th century by John Bill, a printer to King James 1st, who purchased the land in 1616. For the rest of the 17th century and early 18th century, the house would be brought and sold, modified and extended. 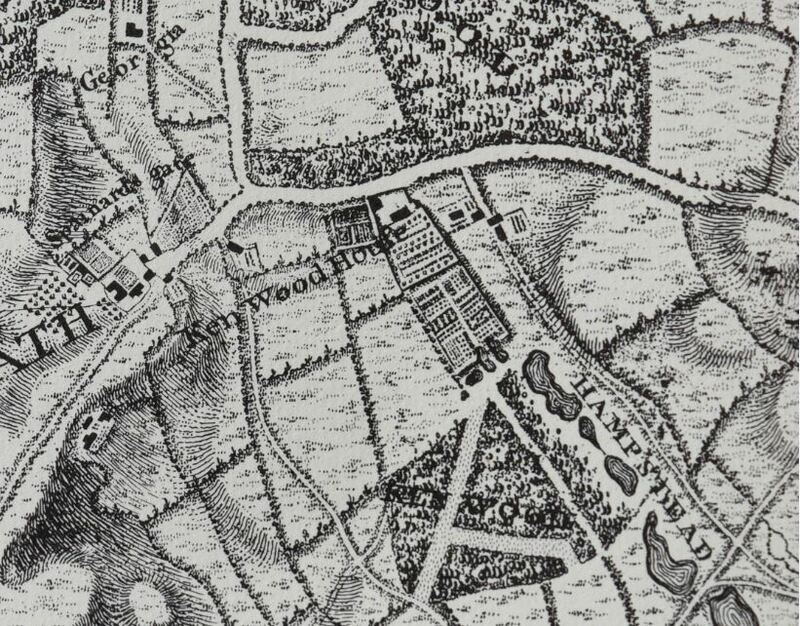 In 1746 the house appears on John Rocque’s map, with the name being two separate words as Ken Wood House, with the name Ken Wood also being found across the wooded area running parallel to the ponds. Whether Ken or Caen the house takes the name from the woods. The house can be seen just above the centre of the following map extract. 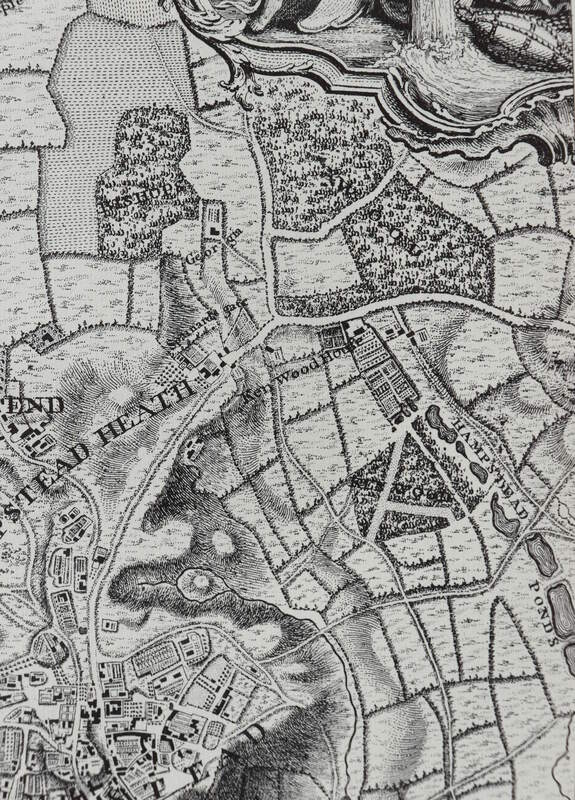 In 1746 the area in front of the house down to Hampstead Ponds was covered by formal gardens. 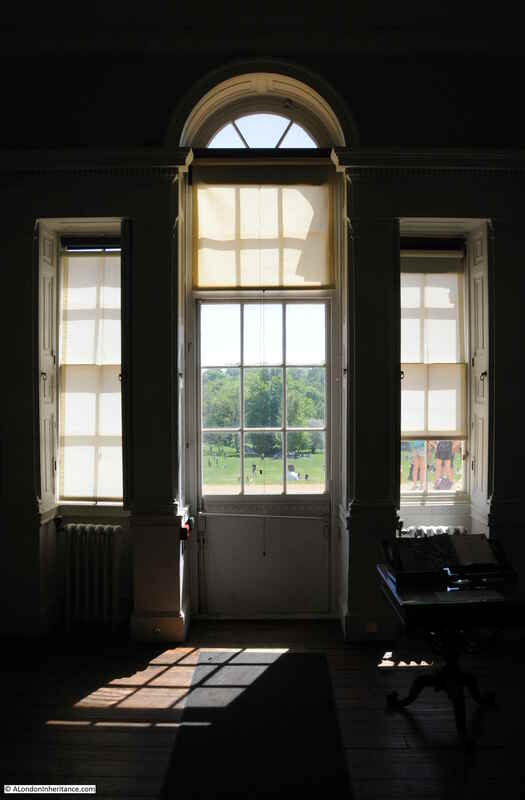 The transformation of the house and grounds to the view we see commenced in 1754 when William Murray, the 1st Earl of Mansfield purchased Kenwood House. 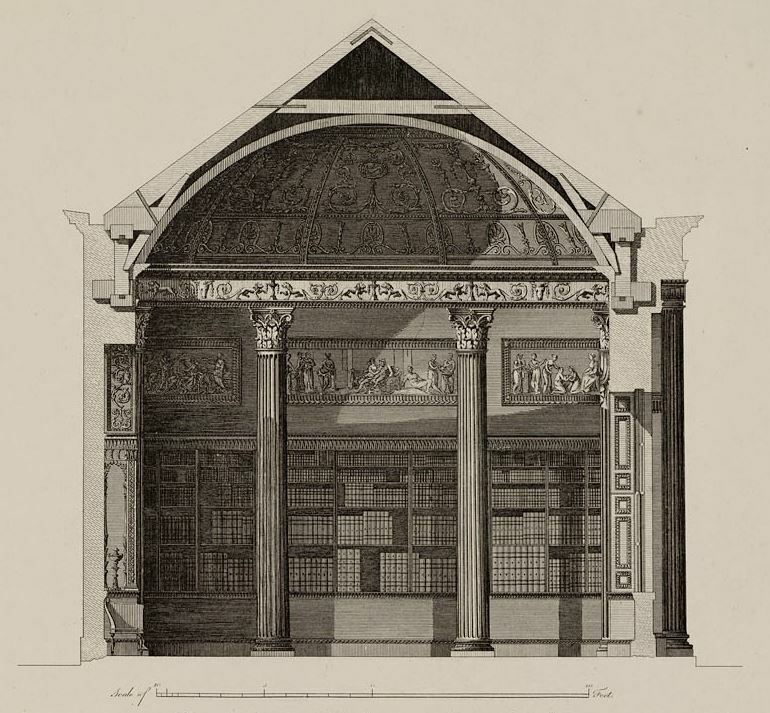 Robert Adam was commissioned to remodel the interior of the house. This included a new northern entrance to the house at the end of the drive from Hampstead Lane, along with interior works. 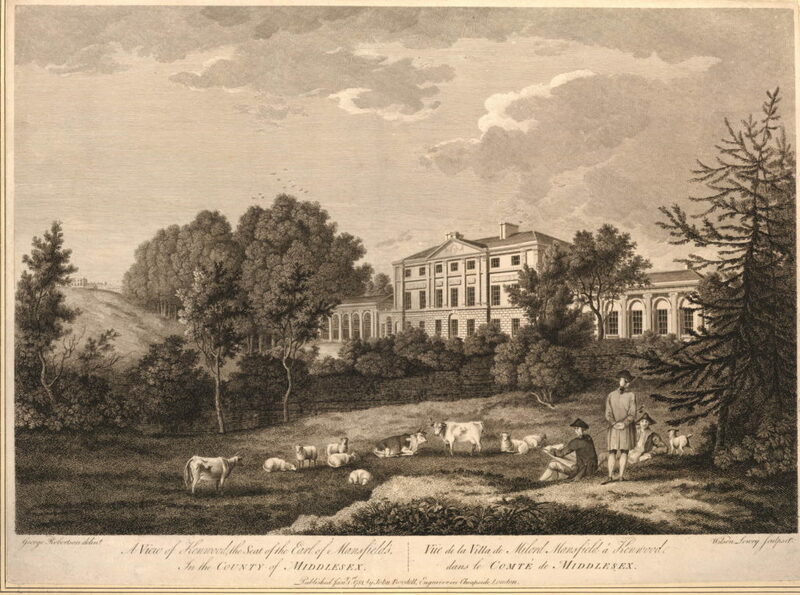 In 1793 Mansfield’s nephew, David Murray became the 2nd Earl and commissioned the Landscape Gardener Humphrey Repton to advise on changes to the land surrounding the house. 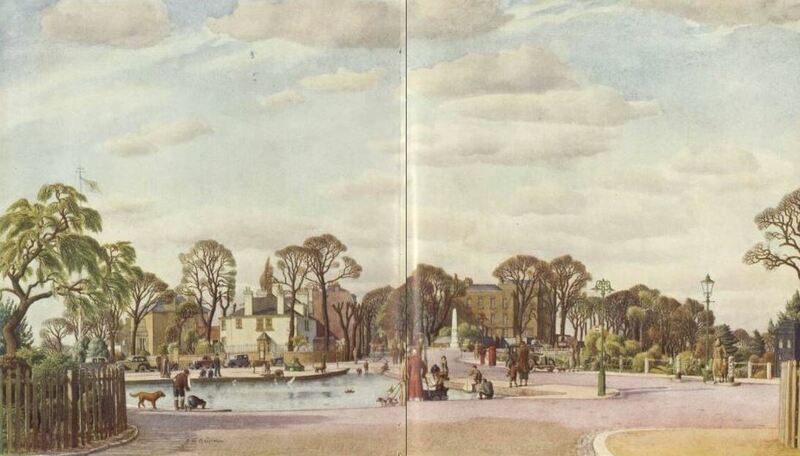 (Humphrey Repton was also responsible for the design of the gardens at the centre of Russell Square). 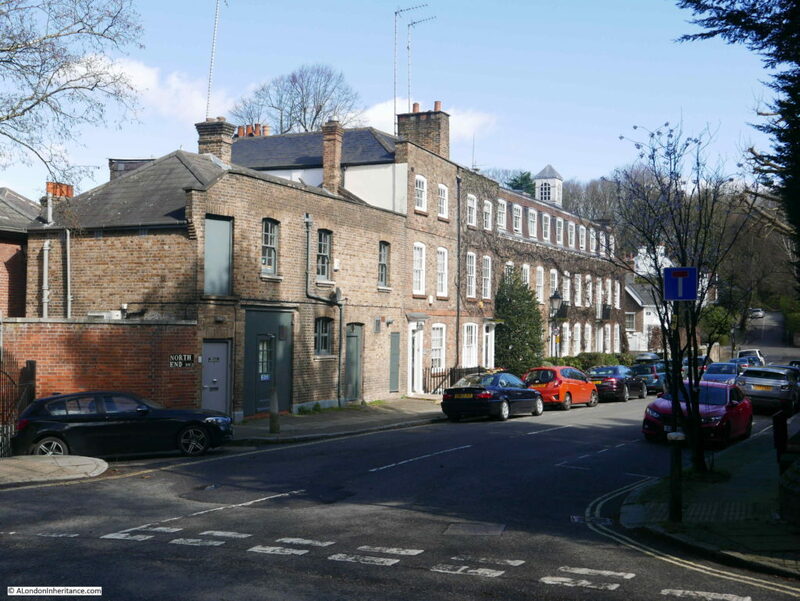 One of Repton’s recommendations was to move Hampstead Lane further away from the house to provide more privacy and to allow a longer, more impressive drive to be built between the house and road (you could do this sort of thing if you were an Earl). 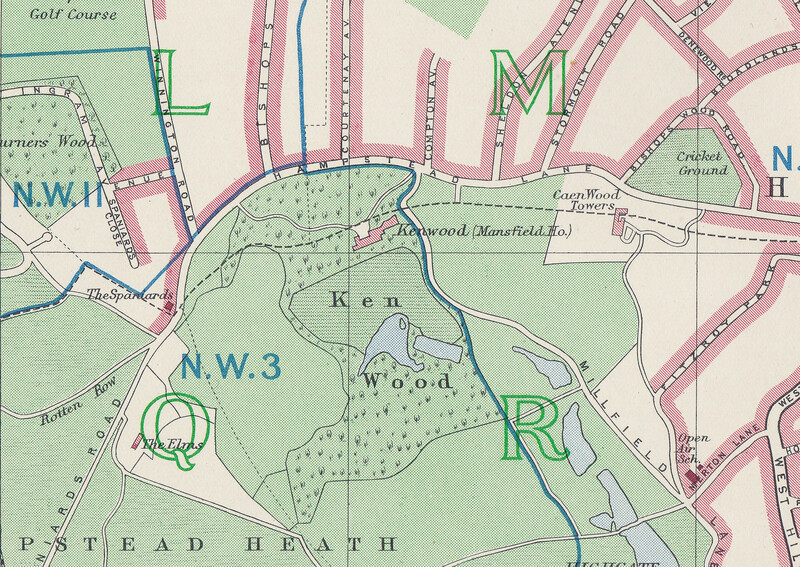 With reference to the earlier discussion of the source of the name as Caen Wood, in the above 1940 map there is a Caen Wood Towers to the right of the map. This is a large Victorian house, now known as Athlone House. 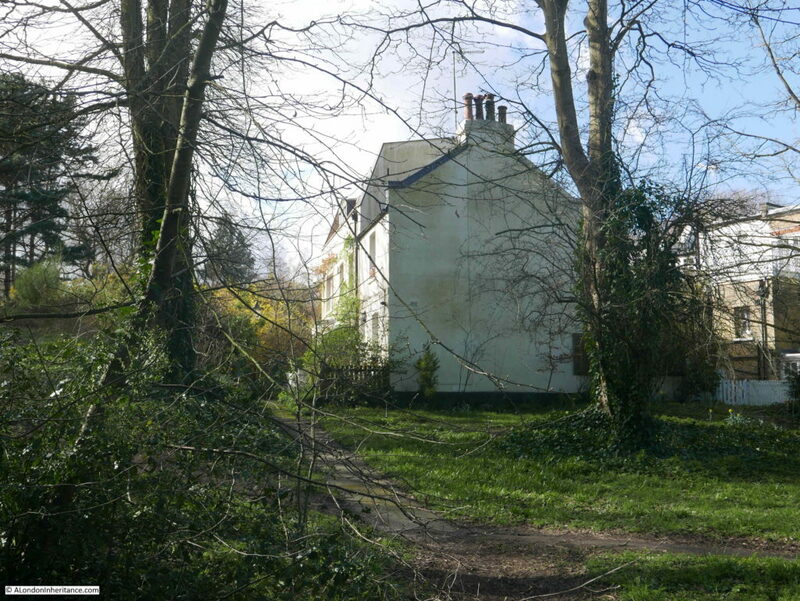 Repton’s proposals can also be seen in the open area at the rear of the house as the land drops down to the lake. Repton’s proposals included planting strategically placed trees to hide the buildings at Kentish Town and also to create the impression that the valley sweeping down from Kenwood House leads directly towards the City of London. The reference to the ‘pleasure-grounds’ refers to the large, grassed area at the rear of the house which slopes down to the ponds. 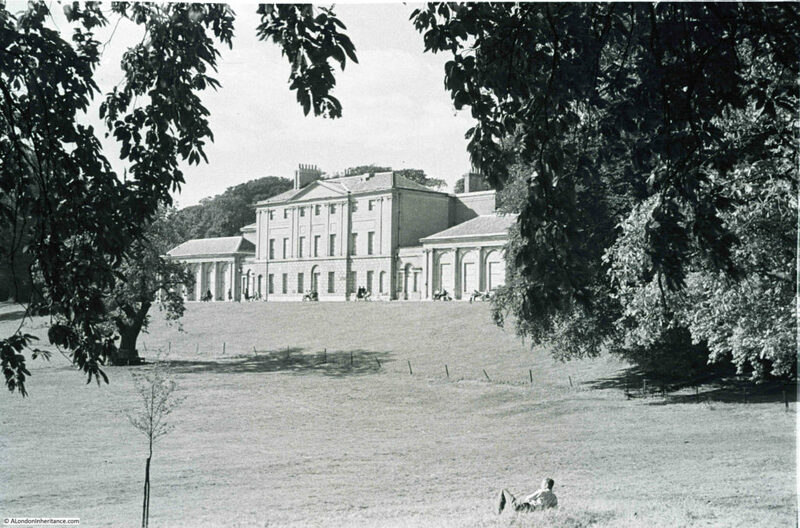 My father had photographed Kenwood House a few years earlier to the photo at the start of this post. 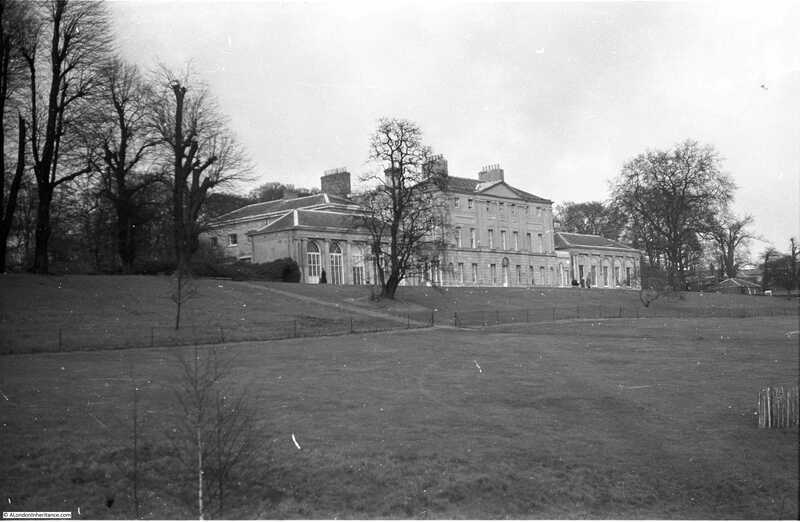 The following photo was taken in 1947 from the western side of the “pleasure-grounds”, looking across to the house. 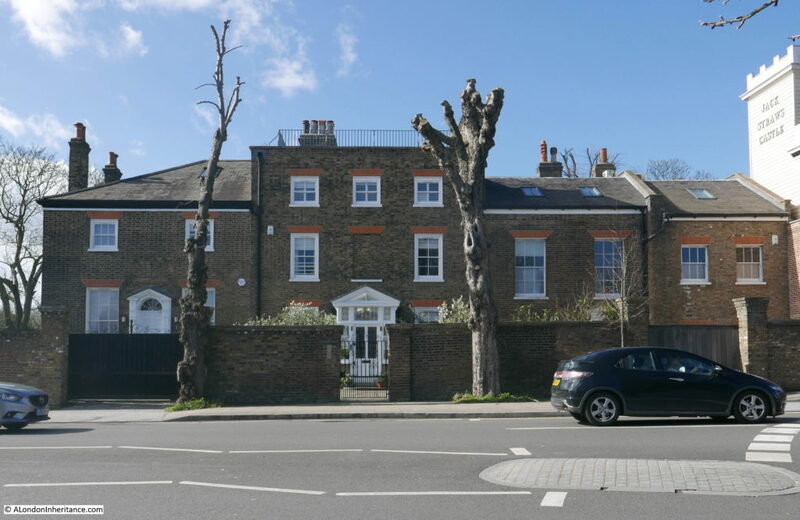 I tried to find the same location, however the tree growth on the western side of the house has been considerable and the following photo is my best approximation of the same viewpoint. Although the majority of the house is hidden behind the trees, the fencing that runs along the middle of both photos provides a good reference point. My father’s photo taken in 1947 was just after the war, when the house was occupied by military servicemen. 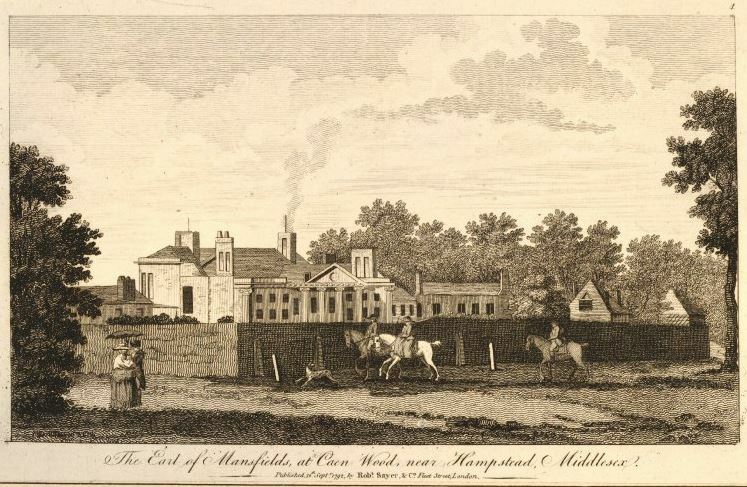 The connection with the Mansfield family had ended a couple of decades earlier when the 6th Earl of Mansfield had sold of the contents of the house in 1922 and in 1925 Kenwood House was purchased by Edward Cecil Guinness, the 1st Earl of Iveagh. 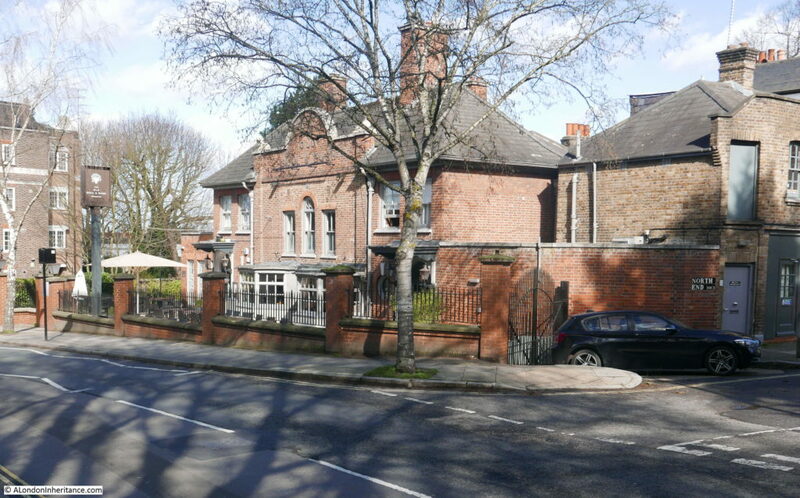 Edward Guinness had a large art collection and in 1929 the Iveagh Bequest stipulated that access to the house for the public should be free of charge, and the art collection maintained in the house. These conditions still hold today with the house having passed through the London County Council, then to English Heritage who run the house today, with access free of charge and Iveagh’s art collection (with a number of additions) still being on display. Whilst the view from the rear of the house is mainly obscured by trees, a short distance to the east of the house there is a viewpoint where a panorama of the City across to the BT Tower can be seen shimmering in the haze. 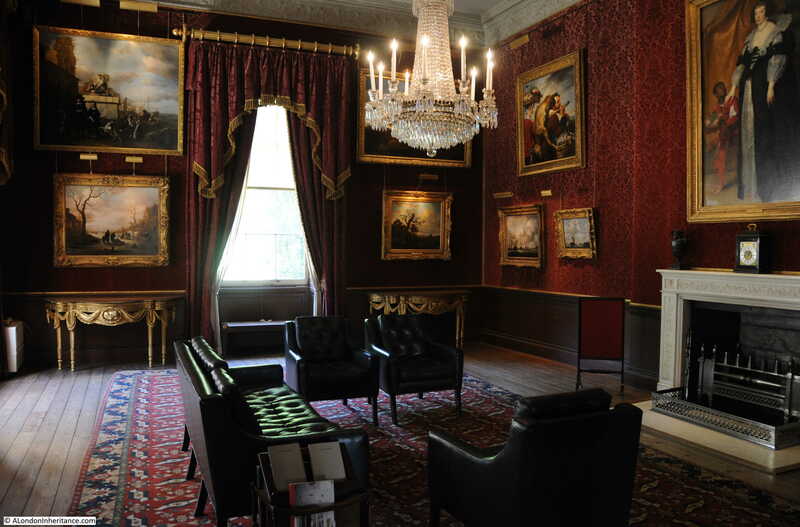 The interior o the house has been carefully restored and the Iveagh art collection is on display in many of the rooms. There is an English Heritage Volunteer in each of the rooms, who, without exception, had an in-depth knowledge the house. It was also much cooler inside the house, compared to outside, although talking to the volunteers. the view was that it was a very cold building to work in during the winter. 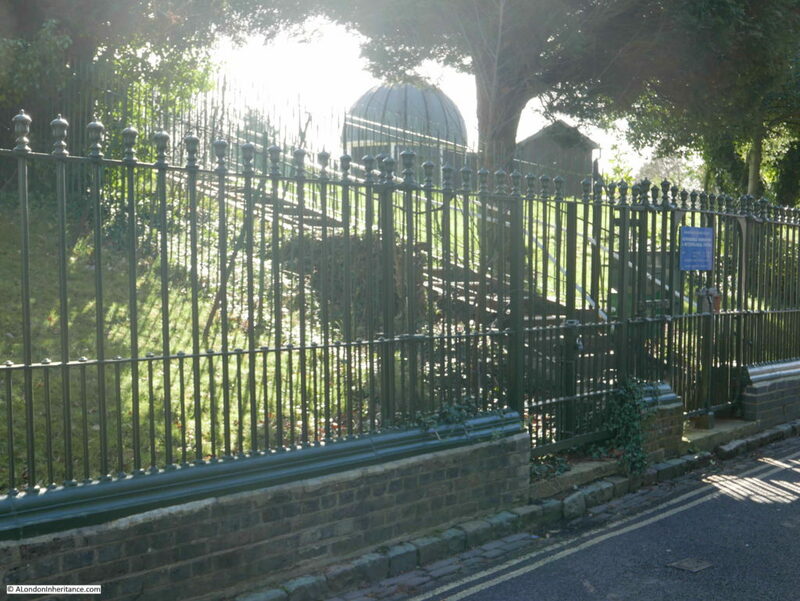 We walked back to Hampstead Lane by a different path, and spotted a couple of boundary markers by the side of the path. The stone marker was very faded but I think may have been a St. Pancras boundary marker. 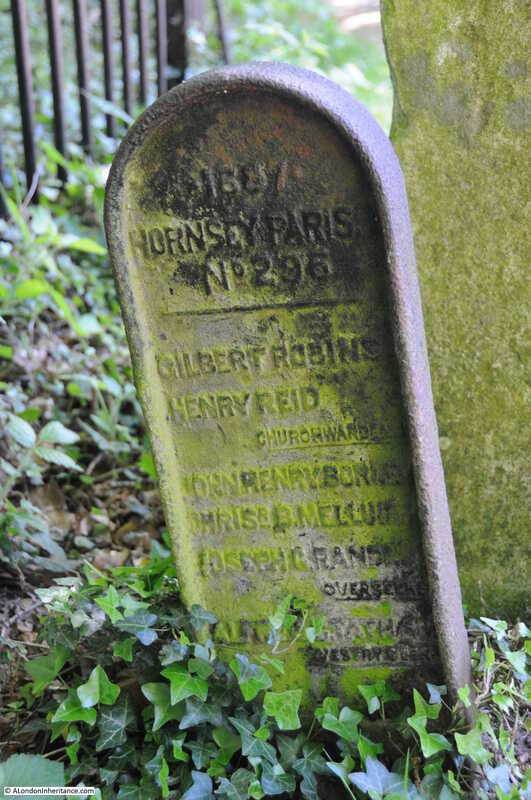 The metal marker is for Hornsey Parish, and is numbered and includes the names of a number of parish officials. 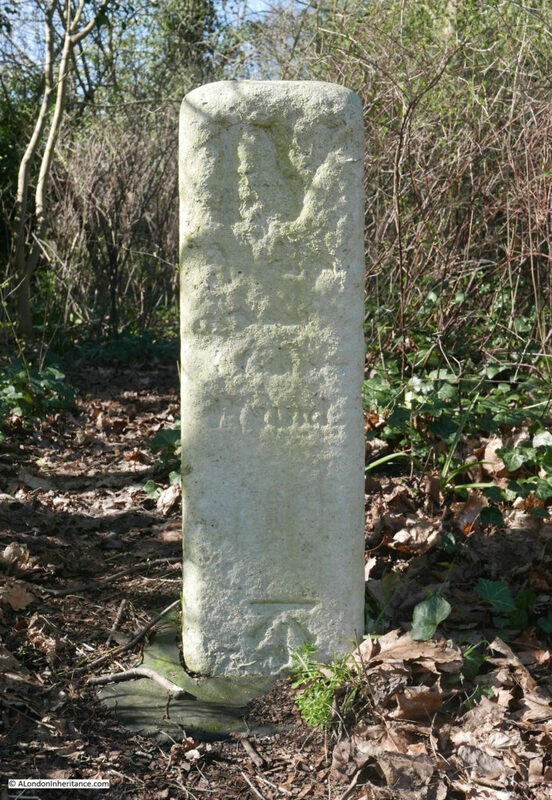 I have seen a number of these Hornsey Parish boundary markers before, but not this one – I should really have been keeping a list of numbers. Hampstead Lane was busy with parked cars occupying every available space either side of the road and still plenty of people walking to the heath to enjoy the rather unusual weather for a public holiday. We left Caen Wood, or Ken Wood via Mansfield’s rerouted Hampstead Lane to walk back to Highgate for some much-needed refreshment. 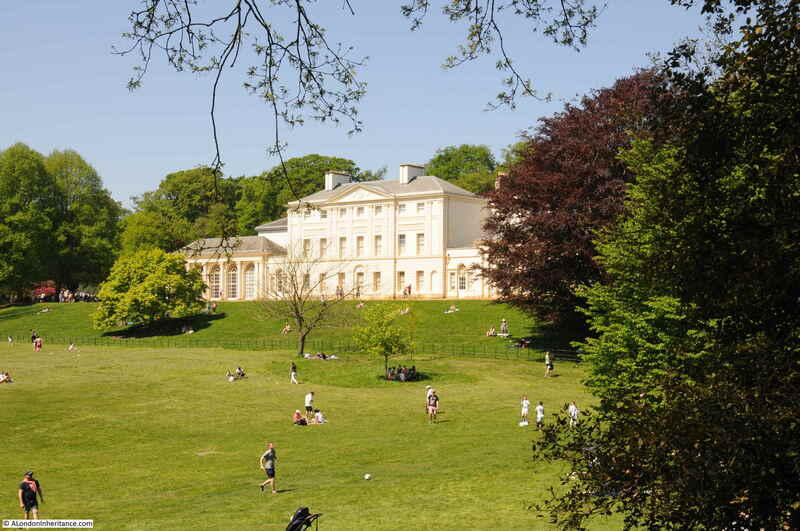 This entry was posted in London Buildings, London Parks and Gardens and tagged Hampstead Heath, Kenwood House on May 13, 2018 by admin.